Green slobber, gasping horse, frantic owner. An episode of choke is one of the worst things a horse and horse owner can experience. As an equine nutrition nerd I deal with all kinds of feeding programs and in every type I have heard of an incident of a horse choking. Heck horses can even choke on long grass. 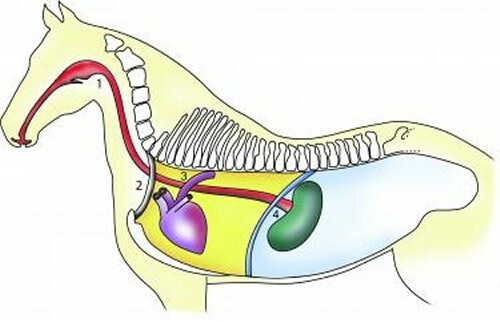 With that said, let’s look deeper in to “Need-to-Knows” about equine esophageal choke. Basically, choke is when there is an obstruction in the esophagus usually when feed material gets stuck. Choke in humans is caused by something lodging in the trachea which then blocks the airway. 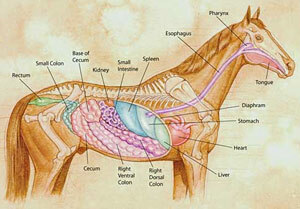 In horses choke is caused by something lodging in the esophagus. A choking horse can breathe, but a choking horse cannot swallow. So the good news is that because this is not as an airway (tracheal) obstruction, a choke is not usually considered life-threatening. 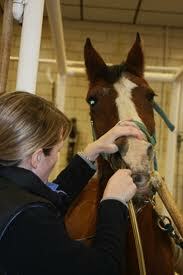 But it is a condition that must be corrected however so complications don’t become a serious threat to horse health. More about that later. The esophagus of the horse is a 4’ muscular structure that begins just above the trachea (windpipe) at the end of the pharynx. When horses eat, they chew food until it forms a bolus (ball of yuck), then the bolus gets pushed into the back of the pharynx and the horse swallows it. After it is swallowed the bolus enters the esophagus. This tube terminates with the cardiac sphincter, which seals off the bottom of the esophagus from the stomach. After the horse has sufficiently chewed food and moistened it with saliva, the food is swallowed and passes down the esophagus to the stomach. The anatomy of the esophagus lends itself to obstruction in certain areas. The beginning of the esophagus, the esophagus’ entrance to the chest cavity, and the esophagus’ entrance to the stomach have narrowed areas that are often the sites of obstruction. · Visibility. If the object or feed bolus causing the obstruction is large enough, and the obstruction is in the portion of the esophagus running along the left side of the neck, then the obstruction might be visible and/or palpable. If the obstruction is farther down and within the chest cavity, then the obstruction will not be able to be seen or felt. A choking horse is pretty easy to diagnose based on the above clinical signs. This video is a typical example of a horse experiencing a choke. If you think your horse is choking, call your vet immediately. A choking horse should not be allowed to eat or drink, and should be kept as calm as possible with his head down until the obstruction can be cleared. Some chokes resolve without treatment. 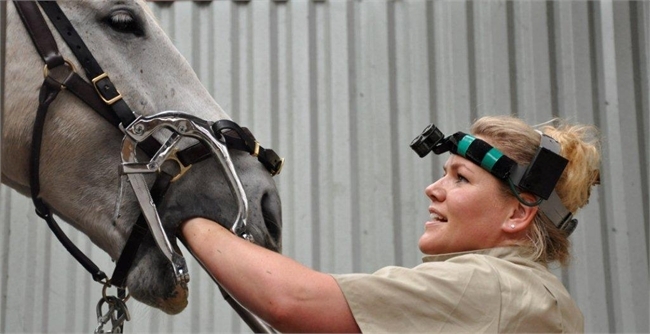 When the vet arrives, they will give the horse a sedative so that he relaxes his throat. Then, they will tube the horse gently to dislodge the item, being careful so that the horse doesn’t breath the item back in. If this procedure is done incorrectly, it can complicate the problem, so this is not a “home remedy” option. When the obstruction is cleared, your vet might suggest a few medications. 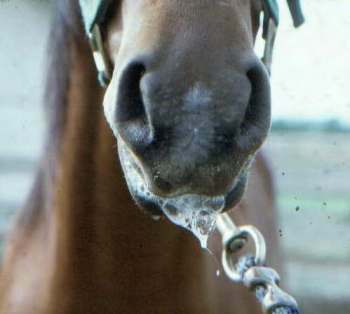 First, the horse’s throat will greatly benefit from some pain medication to relieve the inflammation that the obstruction and the tube have caused. Secondly, a round of broad-spectrum antibiotics, as choking horses are at risk of developing aspiration pneumonia. It is easy for your horse to accidentally inhale a bit of food or icky gooey saliva during the time when they cannot swallow. No owner wants to fight a case of aspiration pneumonia, because unfortunately you normally lose. Generally, the outcome is good. However, it is really important to watch the horse to make sure he didn’t aspirate anything. So, you need to take his temp three times a day and check his heart rate often the first few days to make sure he doesn’t develop pneumonia. Your vet may also prescribe a diet of wet mashes for a few days to give the swollen esophagus time to heal. Surgery is usually not necessary, but may be performed as a treatment of last resort. Most people blame a choke on the type of feed a horse eats but in reality there are a number of factors that can lead to a choke. 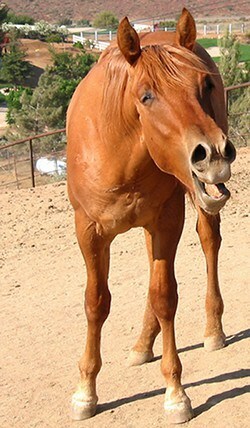 The number one cause of choke is a horse eating too quickly and swallowing before the food is chewed properly. So it really doesn’t matter if its sweet feed, pellets, beet pulp or hay. If the horse eats too fast, he might choke. 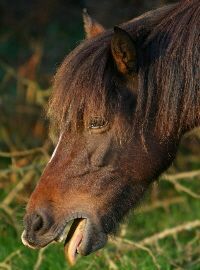 The second most common cause is dental problems such as missing or painful teeth which cause a horse to not chew feed completely. 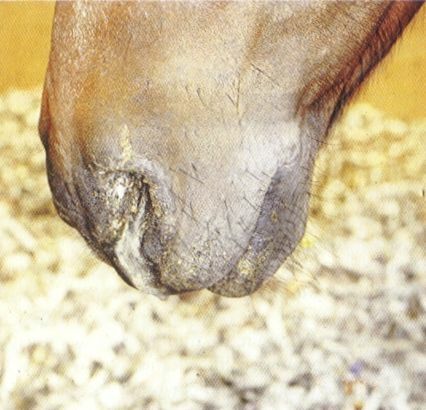 Sometimes a horse will not produce enough saliva to wet food properly when eating and in other cases the horse has a partial obstruction of the esophagus resulting from a tumor or scarring from old injuries. 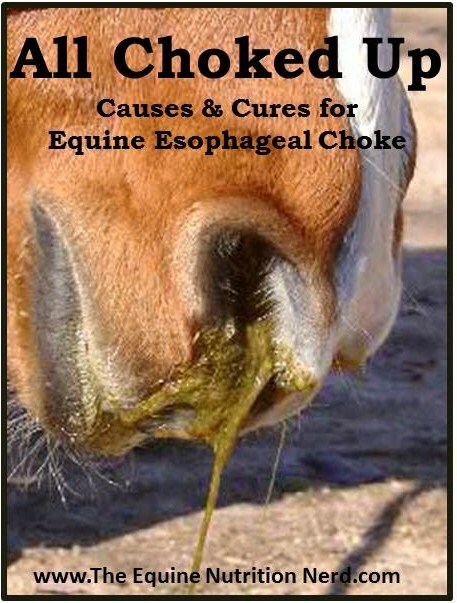 If you have a horse that chokes all the above causes should be considered before you chock it up to the type of feed. After reading what happens during choke (or worse after experiencing an episode) you will want to take steps to avoid any future occurrences. There are a number of ways in which the horse owner can help prevent a choke. 1) Schedule regular dental exams. Inadequate saliva is often linked to choke. If a horse is uncomfortable when chewing because his teeth need to be floated (filed smooth), he will chew less and therefore may not produce enough saliva to moisten his food. Teeth should be checked once or twice a year. 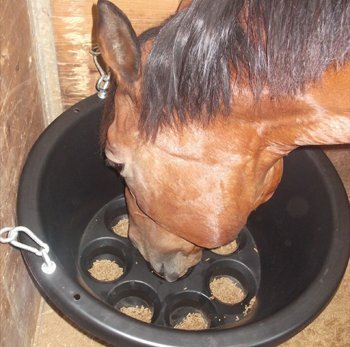 Minor corrections can increase comfort and encourage the horse to chew feedstuff more thoroughly. 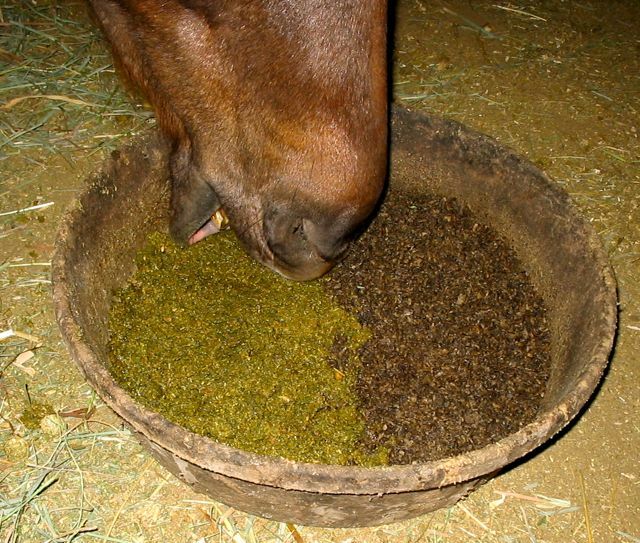 2) The most common reason a horse chokes is a horse bolting his feed. Owners need to determine why this is happening and try to find a solution. a) If they are fed in a group and have competition for feed they will eat quickly to avoid confrontation. Isolating your horse or an aggressive one at feeding time may help. 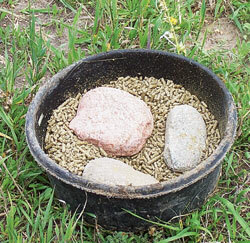 b) If the horse eats alone but still bolts his food try using a brick or smooth stones in the bottom of his feed tube (which should be on the ground by the way) or using a slow feeder to decrease the rate of ingestion. c) Making sure the horse is not quite so hungry at mealtime, either by feeding some hay before grain or by feeding smaller meals more frequently. 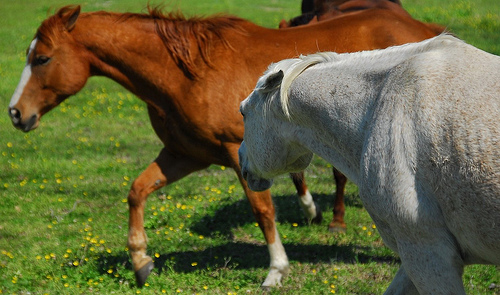 e) Horses that are ill or exhausted may not have the energy to chew their food well. 3) High fiber feeds can potentially cause choke because they absorb moisture by design. You could soak or wet it prior to offering to horses. 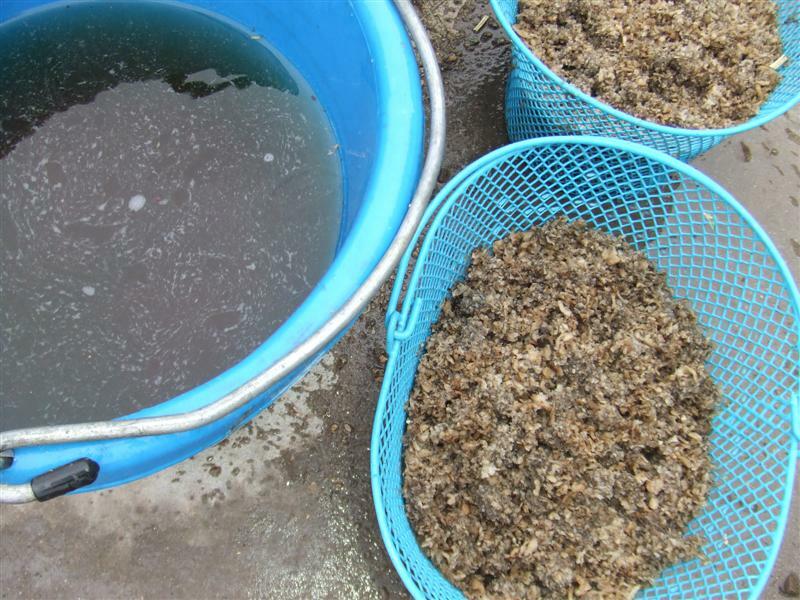 Wetting feeds will not destroy their nutrient content and it is a great method to avoid a potential choke. In fact, wetting feed (either the hay or the grain) is a very practical means to prevent choke in horses that may be prone to it. 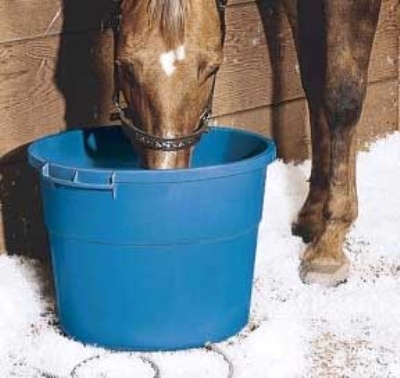 Owners can soak beet pulp and hay before feeding, and can add water to dry feeds such as pellets and alfalfa cubes. It is my hope that you never have to experience an episode of choke. If you do, I hope this article provides some insight and knowledge.